Bilbo and the Dwarves watch from the Lonely Mountain as the dragon Smaug destroys Laketown. Bard manages to break out of prison and kill Smaug with the black arrow, and the dragon's falling body crushes the fleeing Master of Laketown. Bard, chosen as the new leader, and the Laketown people seek refuge in the ruins of Dale. Tauriel travels to investigate Mount Gundabad with Legolas. Upon arriving at Erebor, Fili, Kili, Bofur and Oin are informed by Bilbo that Thorin has been inflicted with Smaug's "dragon sickness" and thus has gone insane as he searched for the Arkenstone. It is revealed that Bilbo actually stole the Arkenstone from Smaug but knows it should be hidden from Thorin, who orders the entrance of the Lonely Mountain be sealed off. Meanwhile, Galadriel, Elrond and Saruman arrive at Dol Guldur and free Gandalf and engage the Nazgul while Radagast arrives and escorts Gandalf away. When Sauron confronts the group, Galadriel uses Eärendil's light to banish Sauron and the Nazgul from the fortress. Saruman tells Elrond to take the exhausted Galadriel to safety while he deals with Sauron. Gandalf leaves Radagast for Erebor to warn of the Orc army approaching the Mountain. Azog, marching on Erebor with his vast Orc army, sends Bolg to Gundabad to summon their other army. Legolas and Tauriel witness the march of Bolg's army, bolstered by Goblins and giant bats. While Bard and the Laketown survivors shelter in Dale, Thranduil and his elf army arrives with supplies and aid, and forms an alliance with Bard, wishing to claim a necklace of white gems from the Mountain. Bard attempts to negotiate and reason with Thorin to avoid war, who refuses to cooperate, much to the company's dismay. After Gandalf arrives at Dale, Bilbo sneaks out of Erebor to hand the Arkenstone over to Thranduil and Bard. The next day, Bard and Thranduil's armies gather at the gates of Erebor, offering to trade the Arkenstone for gold. Thorin learns of Bilbo's deception and nearly kills him, before Gandalf forces Thorin to release Bilbo. Meanwhile, Thorin's cousin Dáin arrives with a Dwarf army and prepares to attack the Elves and Men before Azog's army arrives. With the Orcs outnumbering Dain's army, Thranduil and Bard's forces, along with Gandalf and Bilbo, join the battle. Due to the many good reviews, I actually had a very high expectation of this movie. After watching the movie, actions aside, I felt it was overrated. The plots were somewhat expected and at times a little over dramatic. I guess the actions took over the film hence the rave reviews. It was entertaining with the many fight scenes but I guess I shouldn't have set the bar too high. I actually preferred the earlier 2 parts especially the first one, An Unexpected Journey. Genre: A 2014 epic fantasy adventure film, directed by Peter Jackson and written by Jackson, Fran Walsh, Philippa Boyens, and Guillermo del Toro. 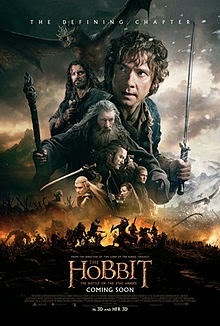 It is the third and final installment in the three-part film adaptation based on the novel The Hobbit by J. R. R. Tolkien, following An Unexpected Journey (2012) and The Desolation of Smaug (2013).